Sharing the Peninsula with the City of San Francisco, San Mateo County is ideally located at the crossroads of three major freeways. 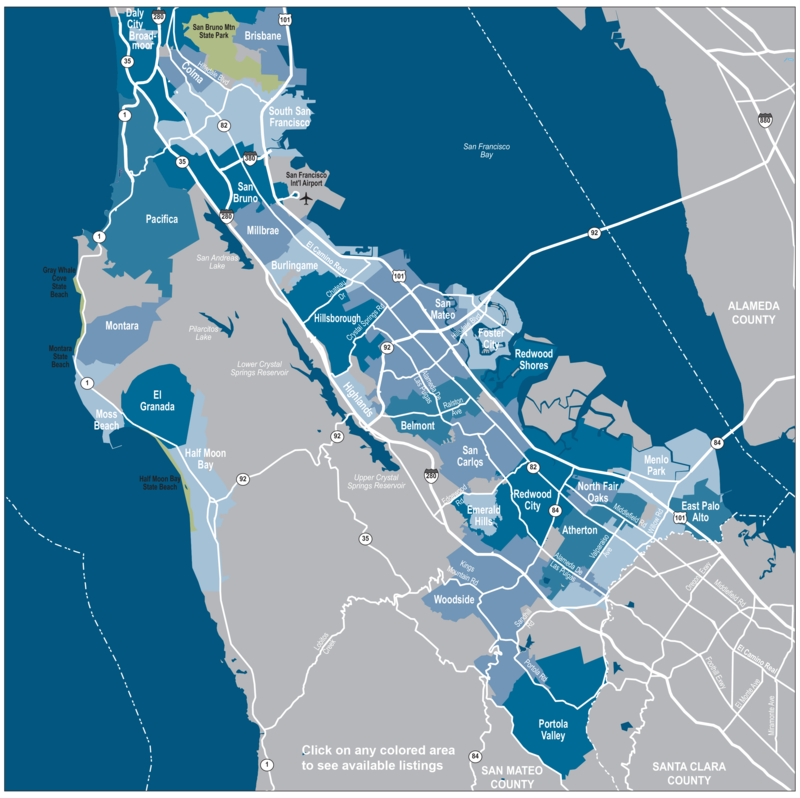 The topography of the region includes a lush, hilly countryside graced by bay and ocean coastlines, creating a panoramic backdrop for the unbroken chain of suburbs along El Camino Real. Originally known as the old “Royal Road,” the historic thoroughfare of El Camino Real once connected some of the first Spanish mission settlements in the Golden State. The coastal mountain range running north and south divides the lightly populated western region from the heavily populated eastern corridor that stretches from San Francisco on the north to Santa Clara County and Silicon Valley on the south. The throngs of Bay Area commuters who have chosen a community in San Mateo County as their residential haven are following a rich legacy that dates back to the 19th century. Some of San Francisco’s earliest gold, silver, and railroad magnates looked to scenic San Mateo County as the ideal location for their palatial homes and posh country clubs. From its first luxurious roots, the county matured and expanded over the decades, adding tracts of modest homes and bungalows, bustling commercial centers, planned communities, and prestigious developments that included stately mansions and custom homes. San Mateo today continues the legacy of its genesis, ranking among the wealthiest of California’s counties. As a favored residential location for Bay Area residents, the county became so densely settled in the population explosion that rocked the Peninsula after World War II that government planners were forced to concentrate on preserving open space. While the census is still swelling, the concerted effort to protect undeveloped land has slowed the flood to a more manageable stream of residential and business newcomers. Although San Mateo County has long been a suburban retreat for those employed in Bay Area employment centers in Silicon Valley or San Francisco, the area’s scenic beauty and charm have attracted an impressive list of high-tech companies, retail centers, industrial parks, and service industries. Yes, the agricultural impact on the economy is still significant, led by flower and nursery crops. However, fruits, vegetables, and livestock are just a fragment of the today’s story. Through the decades, the county has developed its own attractions and economy, reversing traditional commuter patterns. Executive suburbs now share the region’s mild climate and abundant sunshine with tree-shaded housing developments, diversified industries, and innovative businesses. The close proximity of international centers of excellence like Stanford University and its related research facilities have drive the proliferation of high-tech businesses. The Stanford Linear Accelerator Center is Menlo Park is a two-mile-long linear electron accelerator that explores the small particles of atoms. So advanced and significant is the research at this facility that work on particle beams resulted in a Nobel Prize in physics in 1976. Called “Software Valley” by some, San Mateo combines corporate headquarters with software-industry leaders and biotechnology-related employers. In many communities, a regional healthcare institution is one of the primary employers. Kaiser Permanente has established major medical centers in South San Francisco and Redwood City, while the Mills-Peninsula Medical Center divides campuses between Burlingame and San Mateo. Nearby Palo Alto offers the Lucile Packard Children’s Hospital affiliated with Stanford Hospital. Also in neighboring Palo Alto is the Stanford Hospital and Clinics, a global leader in diagnostics and innovative treatment. Other excellent hospitals combine with private and public support facilities like as emergency clinics, convalescent hospitals, and rehabilitation centers to meet every healthcare need. Education is another point of excellence for San Mateo County, where public school districts benefit from innovative teaching techniques and the cooperation of parents, teachers, and the local business community. Dozens of private schools are scattered throughout the county —both church-affiliated and independent — to offer families a full range of educational choices. Educational resources also support the advancement of new technologies, providing the skills and training for emerging industries. A trio of convenient community colleges ensures opportunities for technical and vocational training, college-track programs, Associate’s degrees, and certifications. Canada College in Redwood City, the College of San Mateo in San Mateo, and Skyline College in San Bruno offer educational opportunities while they enrich the surrounding communities with athletic facilities, expansive libraries, and cultural amenities. The Bay Area has long been known for its superb colleges and universities, including institutions with international reputations for excellence like Stanford and some of California’s most acclaimed public universities. Students, commuters, visitors, and residents alike enjoy an efficient network of interstates and major highways in San Mateo County, linking each community with San Francisco to the north, San Jose to the south, and the East Bay to the east. Even though San Francisco has retained ownership of its international airport, the facility is actually located in South San Francisco —encompassed in the boundaries of San Mateo County. While it’s true that many residents still prefer driving a private car to work, shopping, school and entertainment; public transportation systems are continually expanding and improving. A growing number of commuters are discovering that BART light rail and buses are the least expensive and most carefree way to reach their destination. With its rustic small towns, balanced cities, and flourishing metropolitan centers, San Mateo County provides a full complement of environments and possibilities to support virtually any lifestyle choice. Newcomers can choose from the golden sunsets and rugged coastline of Pacifica, the rustic charm of Half Moon Bay, the vintage neighborhoods of San Mateo, or elegant modern developments in Foster City. Equestrians will want to explore the home sites and horse ranches in Woodside, while boaters and water sports enthusiasts can choose from several lovely bayside or coastal communities with outstanding marinas. The moderate climate and comfortable year-round temperatures, the abundance of quality amenities, and well-educated residents make San Mateo County one of the West Coast’s most desirable locations. Probably the most outstanding of the area’s undeveloped land preserves in the San Francisco Watershed. Covering 23,000 acres of scenic woodland preserves, five lakes, and gentle hills, the region is traversed by winding roads that climb up and over ridges to provide spectacular vistas of the Pacific Ocean on the west and the Bay to the east. A number of parks are nestled within this expanse of coastal mountains, while beaches along the coast near San Gregorio and Pescadero are popular with surfers and sunbathers. Small, independent recreational facilities dot the region, from handsome stables with equestrian trails to small boat marinas and private aircraft airports. Shoppers who appreciate quality as highly as they value convenience will soon discover that San Mateo County provides an abundance of both. In charming shopping districts, exclusive boutiques mix with casual shops filled with sportswear. Charming historic districts abound, offering a delightful mix of bookstores, bakeries, specialty shops, antique stores, galleries, and bed-and-breakfast inns. Some retail centers even hug the waterfront, ensuring refreshing breezes and relaxing outdoor dining experiences. For a full day of mall shopping, major centers are scattered throughout the Peninsula. Neighboring Palo Alto features the Stanford Shopping Center, a premier mall where lush gardens create the backdrop for the nation’s leading retailers. On the weekend, few activities are more relaxing than selecting fresh fruits and vegetables from roadside stands, pick-your-own farms, or parking-lot farmer’s markets. Accommodating a wide variety of lifestyles, living needs, and income levels, the cities and communities of San Mateo County offer superb housing options. An attractive selection of apartments, condominiums, and townhouses combine with single-family homes in a variety of architectural styles, settings, and price ranges. Uncompromising value and superior craftsmanship are the hallmarks of many of the area’s foremost builders, who carefully select the finest properties and view lots for development. Although a few meticulously renovated Victorians and handsome Mediterraneans grace the tree-shaded lots in long-established neighborhoods, many developments of newer construction offer everything from dramatic Spanish courtyards to the most modern of architectural lines. In spite of the small-town spirit and warmth that characterizes San Mateo’s communities, world-class cosmopolitan attractions are just minutes from home. Sports enthusiasts need only travel as far as Oakland, San Francisco, or San Jose to see their favorite professional teams in the fury of league competition. Fanatic fans flock to see the Oakland Raiders and 49’ers football, San Francisco Giants and Oakland Athletics (A’s) baseball, Golden State Warriors basketball, SaberCats arena football, San Jose Earthquakes soccer, San Jose Sharks hockey, and San Jose Stealth lacrosse. To the east, Sacramento offers Kings basketball and world team tennis with the Capitals. For weekend getaways or vacations within easy driving distance, San Mateo County serves as the doorway to some of California’s most beloved destinations. The former Olympic ski site of Squaw Valley and many other wonderful alpine resorts are less than a half-day’s drive from home. The famous wine country of Napa, Russian River, and Sonoma Valley is waiting to the north, while Santa Cruz and Monterey Bay coastal communities are less than a two-hour drive. At the edge of the East Bay lies the California Delta, where 1,000 miles of sparkling waterways connect the San Francisco Bay with the Sacramento and San Joaquin Rivers to provide some of California’s finest opportunities for water sports, fishing, and boating. The San Francisco Bay Area is well known for year-round sailing, while the city itself glistens as one of the world’s most attractive and unique metropolitan centers. Aficionados of the performing arts can take advantage of San Francisco’s nationally acclaimed symphony, opera, theatre, and ballet. Internationally recognized museums, gardens, entertainment spots, shopping districts, scientific exploration centers, and galleries abound. For those who desire the best of all worlds, few locales in the nation can rival San Mateo County for natural beauty, quality of life, and sheer enjoyment.